As resistance to ecologically destructive mining projects spreads on the global resource frontiers, multinational mining companies go to great lengths to construct a narrative that ignores or minimizes the effectiveness of popular resistance to extractive resource projects. They would rather blame depressed metal prices, unexpected technical problems or overzealous regulators than acknowledge the role of organized opposition in halting mine projects. Mining and oil companies rarely identify or understand the full range of costs with local communities. “For example,” says Franks, “as a result of conflict, a major, world-class mining project with capital expenditure of between $3 and $5 billion was reported to suffer roughly $20 million per week of delayed production in net present value terms.” While the triggers of company-community conflict are increasingly predictable, says Franks, some companies see community concerns “as optional ‘add-ons’ to broader regulatory processes for operating projects.” This was precisely how GTac viewed the Wisconsin mine permit process. 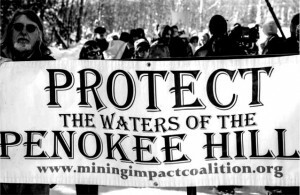 From the very beginning of GTac’s interest in the Penokee Hills in 2010, corporate management ignored tribal and community concerns about the proposed mine and focused on major financial contributions to Governor Walker and key Republican legislators while their lawyers wrote the legislation that would guarantee a mine permit. The pro-mining forces that were lobbying for passage of the Iron Mining bill gave the governor and state legislators more than $15 million in donations between 2010 and mid-2012, according to the nonpartisan Wisconsin Democracy Campaign. Documents recently released in the John Doe investigation of Governor Walker show that GTac contributed an additional $700,000 to the Wisconsin Club for Growth, an organization directed by an advisor to the governor’s campaign. “Because Wisconsin Club for Growth’s fundraising and expenditures were being coordinated with Scott Walker’s agents at the time of Gogebic’s donation, there is certainly an appearance of corruption in light of the resulting legislation from which it benefited,” argued Dean Nickel in a legal filing. Nickel is the former head of the Wisconsin Department of Justice’s Public Integrity Unit who investigated the fundraising scheme for the state Government Account ability Board. Walker claims he was unaware of this donation to his campaign. Nonetheless, the governor met with GTac lobbyists to draft an iron mining bill shortly after taking office in January 2011. GTac lobbyists were heavily involved in crafting the language of a new mining bill that eliminated restrictions on dumping mine waste in wetlands. In stark contrast to the generous campaign contributions to the state’s political elite, GTac was outraged when Ashland County, where part of the proposed mine is located, passed a mining ordinance that would require GTac to pay the county for the costs of hiring scientists to evaluate the extensive environmental studies the company is required to submit prior to the issuance of a county mining permit. GTac responded to the ordinance by threatening to leave about a third of the 4-mile-long deposit in the ground. “We’ve let them know that the ordinance makes it not viable to mine there,” said GTac spokesperson Bob Seitz (“Gogebic may avoid hostile territory,” Wisconsin State Journal 9/5/2014). When GTac president Bill Williams announced he was closing the company’s office in Hurley, Wisconsin he cited the extensive wetlands at the mine site and the uncertainty about whether the mine would be permitted. However, according to the Iron Mining Law (2013 Act 1) that GTac largely wrote, no such assurance is possible until the company has conducted the scientific studies that are necessary to determine whether the proposed mine will meet the requirement of the law. Incredibly, the company never collected the data to find out how the mine would affect groundwater around the mine site. And they were surprised when their consultants found four times as many wetlands than they expected to find at the mine site. This should not have been a surprise. The language of the Iron Mining Law stated that “significant adverse impacts” to the environment and water were assumed to be necessary in order to mine this deposit. 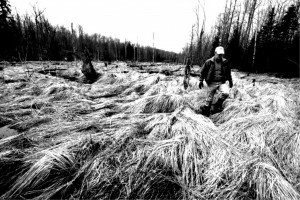 This included the extensive destruction of wetlands that filter the water that flows into Lake Superior, feeds the wild rice beds of the Bad River Ojibwe tribe and provides drinking water to the city of Ashland and nearby towns. 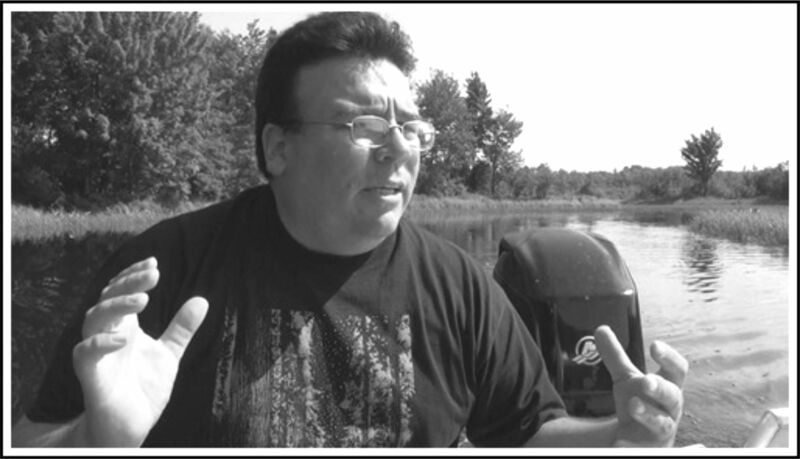 If GTac had listened to what local citizens were saying about the wetlands or to the independent wetlands expert hired by the Bad River Ojibwe, this would not have been a surprise. Instead, the company threatened legal action to prevent the tribe’s expert from identifying wetland areas in the mine site (“Mining firm bars expert from site,” Milwaukee Journal Sentinel 8/25/2013). The Ashland County District Attorney later discounted GTac’s threat, saying that GTac didn’t even own the land and affirmed that the tribe had the right to survey land in the proposed mining area. “This isn’t a game,” said Bad River Tribal Chairman Mike Wiggins. “This is life and death for the people downstream and down wind. 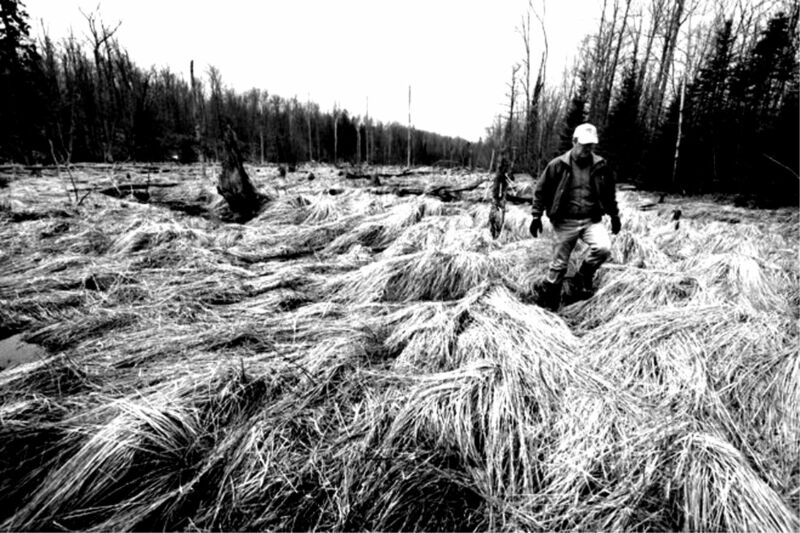 This is life and death for the unbelievable hydrological features of that [Penokee] mountain that flows down into Lake Superior.” Tracy Hames, executive director of the Wisconsin Wetlands Association, said there was no question that it would be practically impossible to mitigate the number and quality of wetlands on the proposed mine site, as required under state and federal law. GTac strongly objected to any public discussion of potential mining impacts before they had submitted their own studies to the state and federal regulatory agencies as part of their permit application. If Wisconsin tribes, environmental groups and local citizens had played by the company’s rules, resistance to the proposed mine would not have emerged at the very earliest stage of the permitting process when the project was most vulnerable. GTac’s attempts to suppress public debate about the project even extended to the Wisconsin Department of Natural Resources (DNR) itself. Tensions between GTac and the DNR became public in 2014 when the company objected to a DNR research document that listed some of the major environmental and health hazards of iron mining, including acid mine drainage, mercury contamination, the health risks (lung cancer and mesothelioma) from exposure to asbestiform minerals at the mine site, the drawdown of the local water table, the loss of subsistence food production such as wild rice and the fact that “six watersheds with a total surface area of 1300 square miles transect the Gogebic Range in Wisconsin and drain to Lake Superior” (Taconite Iron Mining in Wisconsin: A Review). 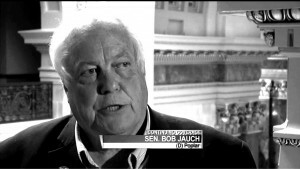 “This attitude is predicated on an approach that comes from a West Virginia coal company mind-set that they can do whatever they want,” noted State Senator Bob Jauch (D-Poplar) whose district includes the mine site. GTac is a subsidiary of Cline Resource and Development Group, owned by billionaire Chris Cline. Cline made his money by acquiring coal mining, processing and transportation facilities in Appalachia and the Illinois Basin. According to Devon Cupery, one of the producers of the documentary film, “Wisconsin’s Mining Standoff,” Cline’s coal mines in West Virginia and Illinois have been cited for over 8,000 federal safety violations since 2004. More than 2,300 were “significant and substantial” violations with the potential for injury, illness or death. But Wisconsin is not West Virginia or Illinois. Cline’s money and lobbying was able to buy the passage of the Iron Mining Law but neither GTac nor Governor Walker consulted the Bad River Ojibwe about the legislation or the mine project. 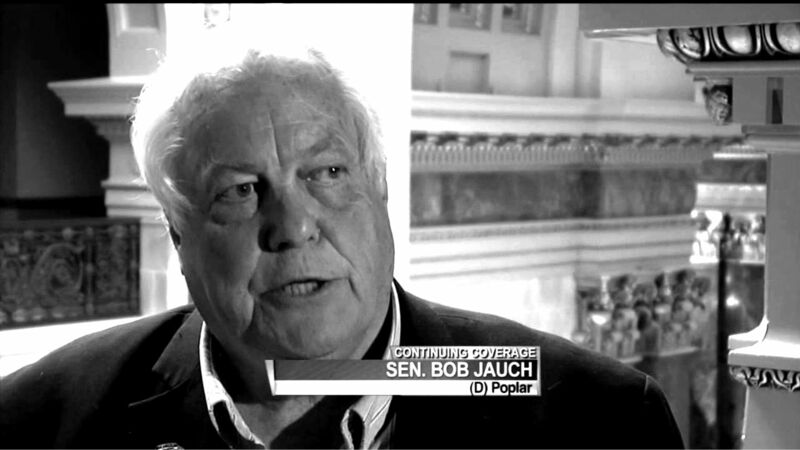 GTac spokesperson Bob Seitz told a reporter that tribal concerns could be addressed after the bill was passed (“Mining firm backs changes, Milwaukee Journal Sentinel 12/3/2012). The failure to consult a tribal sovereign nation about legislation affecting their treaty rights and resources in Wisconsin is symptomatic of the environmental racism that has characterized this project from the start. After the bill passed, Tribal Chair Mike Wiggins reaffirmed the tribe’s intention to continue fighting the project, including the possibility of federal lawsuits based on the tribe’s treaty rights. “This is not a sprint, Wiggins said. “We’re ready to do whatever it takes for however long it takes to defend our home” (“Foes: Opposition will deepen,” Wisconsin State Journal, 3/3/2013). In anticipation of a possible federal lawsuit, the tribe established a legal defense fund. 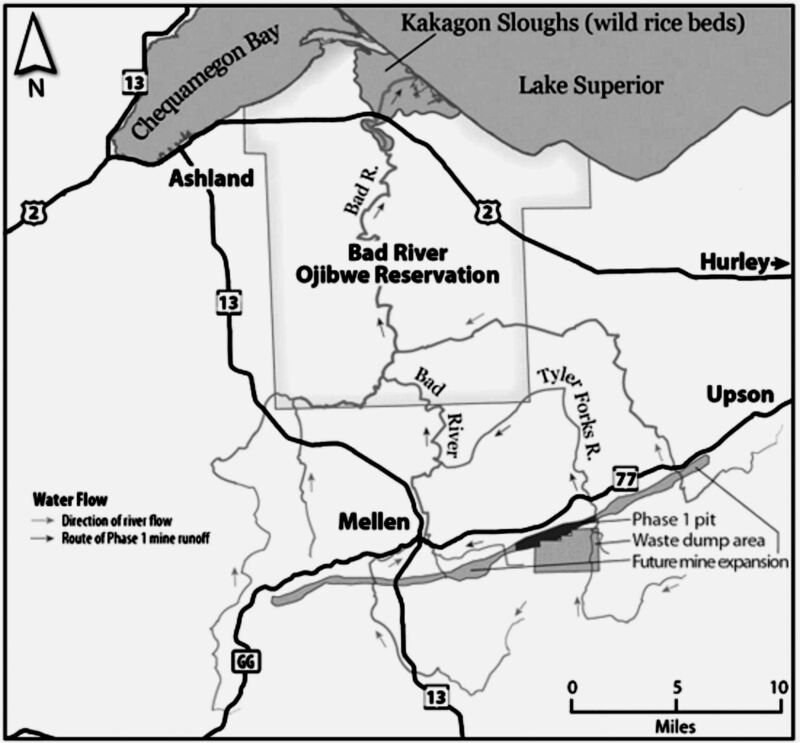 A network of treaty support groups, especially in the population centers of Madison and Milwaukee, assisted the Bad River Ojibwe in hosting fundraising and educational outreach events similar to the successful political mobilization to oppose the Crandon mine project in the previous decade (“The Crandon Mine Saga,” February 2004). 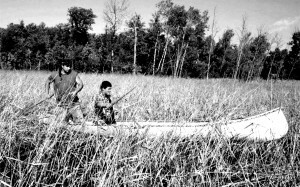 The emergence of Wisconsin’s six Ojibwe tribes as major political actors coincides with the assertion of long-suppressed treaty rights from 19th century treaties that ceded mineral-rich lands in northern Wisconsin, Michigan and Minnesota but retained the right to continue hunting, fishing and gathering on ceded lands. 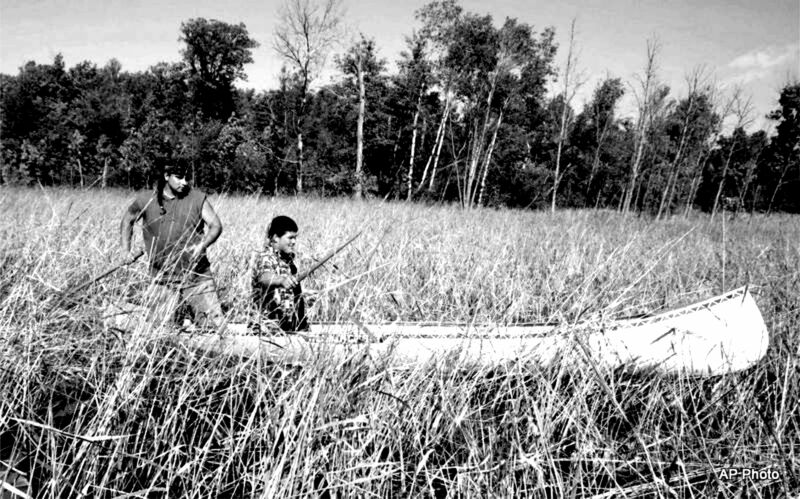 After a federal court decision Lac Courte Oreilles Band of Chippewa Indians v. Voigt reaffirmed Chippewa (Ojibwe) treaty rights in 1983, white sportsmen held sometimes violent protests against Ojibwe off- reservation spearfishing. Anti-treaty groups accused the Ojibwe of destroying the fish and the local tourism economy, even though the tribes never took more than three percent of the fish. When the tribes and their non-Indian supporters demonstrated that the real threat to the fishery and the tourist economy came from large-scale destructive mining projects, the tribes won over many of those who had initially opposed Ojibwe treaty rights. By 1992 much of the anti-treaty protests had died down after a federal court issued a permanent injunction against interference with the exercise of off-reservation treaty rights. After a decade of non-violent resistance to sometimes- violent protests against Ojibwe off-reservation spear- fishing, Wisconsin’s Ojibwe tribes were determined to protect their harvest rights from mine waste pollution. 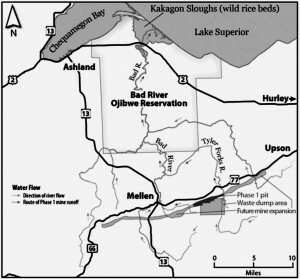 Proposed mining projects at the Lynne site in Oneida County near the Willow Flowage, and the Crandon site in Forest County, were defeated when the Lac du Flambeau and Mole Lake Ojibwe tribes formed alliances with environmental groups and local citizens to oppose these projects. hat authority allows the tribe to protect their wild rice beds and the Lake Superior fishery from mining pollution or reduced flowage upstream from their reservation. 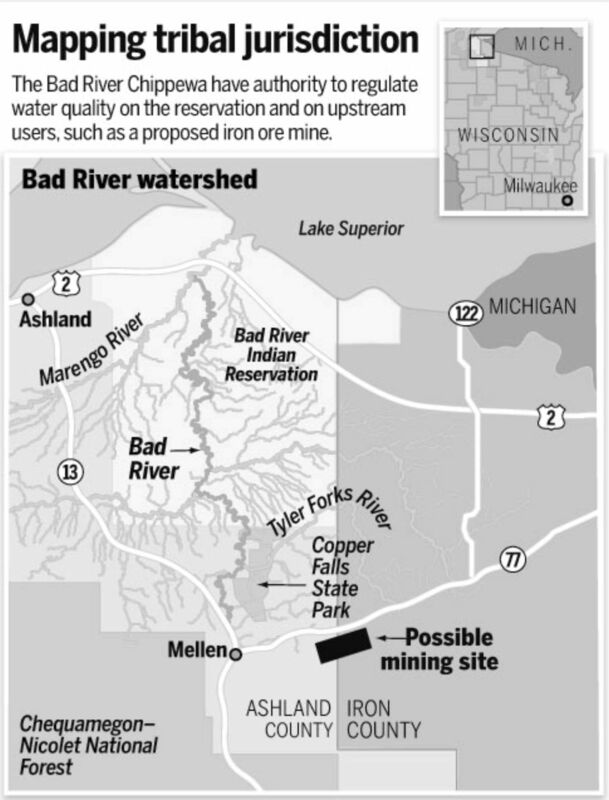 GTac objected to Bad River’s proposed water authority during EPA’s review process saying the standards “appear to be impossible” to meet (“Tribe might have say in mine,” Milwaukee Journal Sentinel 2/18/13). “From just north of the Penokee Mountain area to Lake Superior, our tribe is ready to stand up and protect Nibi (water) for all people and future generations,” said Tribal Chair Mike Wiggins. At the same time, the tribe invited their non-Native neighbors to a series of monthly potluck dinners to discuss how the tribe and surrounding communities could work together to protect the land and water of the region. Ashland Mayor Bill Whalen expressed the solidarity between the Ojibwe and the local communities at a press conference prior to the legislative vote on the Iron Mining Law: “This is not a Native Sovereign issue vs. the State of Wisconsin,” he said. 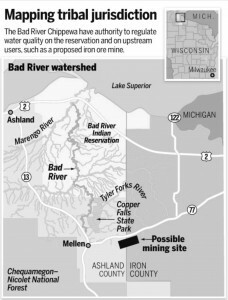 “This is a water and legislative issue that affects us all.” An independent public opinion survey conducted by the University of Wisconsin-Superior in 2013 reported that 61 percent of the respondents in the mining impact area either “absolutely opposed” or “generally opposed” the proposed mine. Statewide opposition to the project was evident in the overwhelming majorities that voted against development of the proposed Penokee mine at the annual Wisconsin Conservation Congress spring hearings in April 2014. The resolution against the mine was approved by 67 percent of the votes in 28 of the 32 counties where it was introduced. The Conservation Congress is a statewide, publicly elected citizens group where environmental groups mingle with the hunting and fishing groups. The Congress is legislatively sanctioned to advise the Natural Resources Board in setting policy for the Wisconsin Department of Natural Resources. In response to declining public support for their project, GTac organized one-on-one listening sessions in the mining impact area in June 2014. However, the sessions required reservations and people who were perceived as “anti-mine” were denied admission. 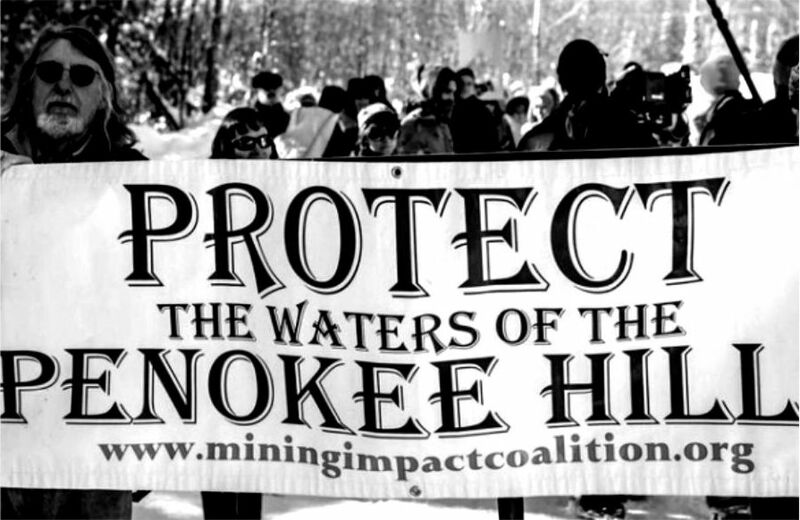 The Penokee Hills Education Project, a local group that has brought Native and non-Native mining opponents together, countered GTac’s propaganda with a series of listening sessions called “Truth and Reality of the Penokee Mine.” No reservations were required and attendance far exceeded participation in GTac’s sessions. The first indication that GTac might pull the plug on the Penokee mine project was in January 2015 when GTac president Bill Williams told Iron County board chair Joe Pinardi that he was not allowed to spend any more money on the project. That included a $20,000 payment to renew a lease option for 2 years on county land that is part of the 3,000 acre mine site. This is the same company that contributed $700,000 to help Governor Walker and Republicans survive recall elections in 2011 and 2012 and guarantee the votes to pass favorable mining legislation. Without the lease, there was no mine project. However, GTac spokesperson Bob Seitz objected to parts of Iron County’s proposed mining ordinance that would have required the company to pay for experts to assist the county in evaluating scientific reports on mining impacts. GTac had the same objection to Ashland County’s mining ordinance the previous year. Iron County officials were desperate to accommodate GTac in hopes of generating mining employment so they offered to delay the lease payment until the next year when GTac would owe the county $30,000 to cover 2015 through 2017. This only fueled speculation that the company was ready to pull out of the project. But Seitz told a reporter that GTac intended to proceed with a mine and was redesigning the mine plan to limit damage to wetlands (“Gogebic shifts mine strategy,” Milwaukee Journal Sentinel 2/4/15). But if GTac was not spending any more money on the project, who was paying engineers for a new mine plan? There was no new mine plan. Instead, Governor Walker was considering Bob Seitz for the post of deputy secretary of the Department of Natural Resources, the same agency in charge of mine permitting. Based upon emails and other documents released to the Milwaukee Journal Sentinel under the state’s open records law, Walker’s appointments adviser was considering Seitz for the post at the same time (January 30, 2015) as GTac was denying any plans to abandon the mine project (“Mine lobbyist was up for job,” 4/7/15). Governor Walker had to withdraw the offer because of a federal law that prohibited conflicts of interest regarding the issuance of air and water permits. Instead of the number two position at the DNR, Seitz was offered a position with the Public Service Commission. GTac misled the public for an entire month before the February 27 announcement that the company was closing its office in Hurley, Wisconsin. In addition to blaming the EPA, Bill Williams told a reporter “there is still a subculture at the DNR, for lack of a better word, that is green.” Just to make sure this subculture does not get in the way of future mining projects the governor’s recent budget cuts 66 DNR staff from the department’s science bureau, fisheries, forestry and education operations. DNR Secretary Cathy Stepp insists that the agency is not abandoning science. Just the scientists. By blaming the EPA and a “green subculture” at the DNR, Williams diverts attention from the fact that GTac failed to secure a social license to operate by ignoring and suppressing the objections to this project from concerned citizens, tribes, environmental groups and local governments. GTac is gone but they left behind legislation that seriously weakens environmental protections for any future mining project. Repeal of the Iron Mining Law is now a top priority for the grassroots movement that stopped GTac. 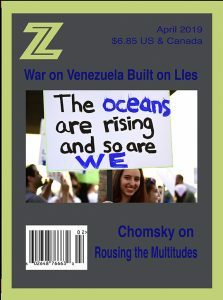 Al Gedicks is professor emeritus of sociology at the University of Wisconsin/La Crosse and Executive Secretary of the Wisconsin Resources Protection Council. He is the author of Resource Rebels: Native Challenges to Mining and Oil Corporations.